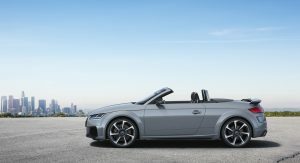 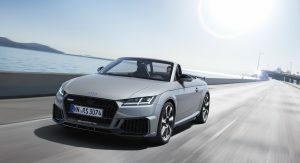 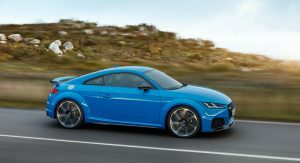 The 2020 TT RS Coupe and Roadster follow in the footsteps of the regular models with a few design updates for the new model year. 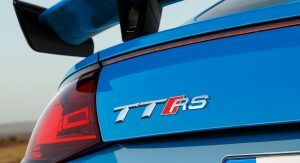 The revised RS features revised styling at the front and rear, joined by larger lateral air inlets and a new fixed rear wing with side winglets. 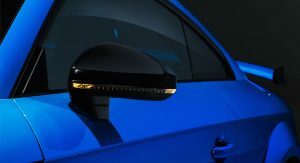 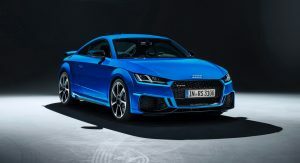 The facelifted TT RS now has LED headlights as standard, and matrix units with matrix OLED reversing lights that put on a small show whenever the ignition is being switched on, as an option. 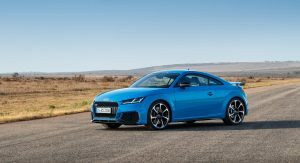 Clients will have eight colors to choose from, including the model-specific Kyalami Green and the new Pulse Orange and Turbo Blue. 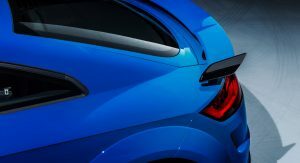 Additionally, they can spec the car with the Matte Aluminum or Gloss Black styling packages that highlight the front blade and rear wing. 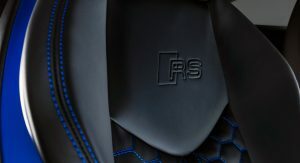 The latter option adds black Audi rings and TT RS logos, while the Roadster gets a black fabric roof. 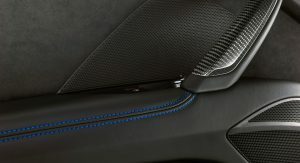 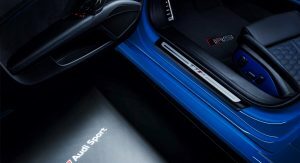 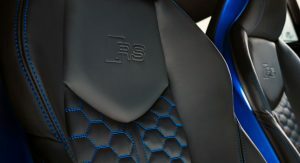 New color touches adorn the cabin as part of the new RS Design Package, which adds red or blue trim throughout the interior, while the Extended RS Design Package offers contrasting design elements on the seats and central console. 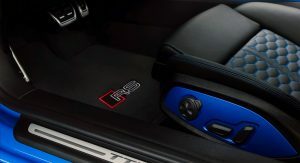 The MMI Navigation Plus is optional and includes voice control, free text search and a Wi-Fi Hotspot. 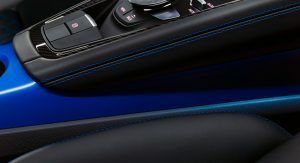 Connecting a smartphone to the infotainment system requires using the USB port. 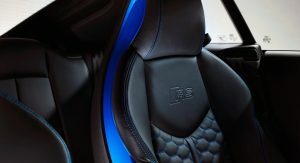 and the 680-watt Bang & Olufsen premium sound system provides a special experience to audiophiles. 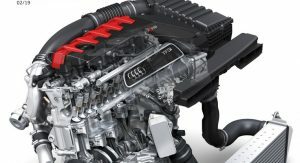 No revisions have been made to the engine. 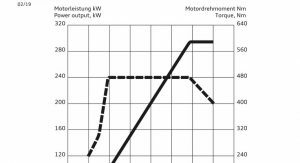 Thus, the 2.5-liter five-pot still has an output of 400 PS (394 hp / 294 kW) and 480 Nm (354 lb-ft) of torque. 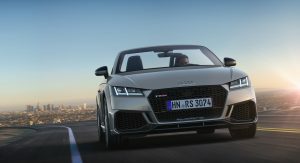 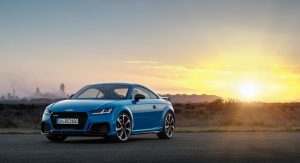 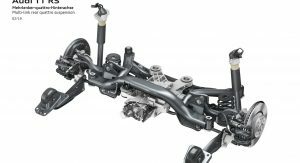 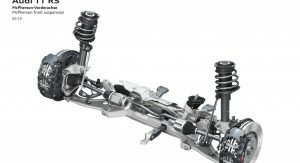 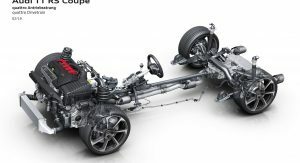 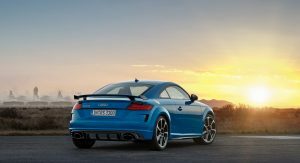 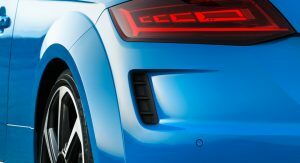 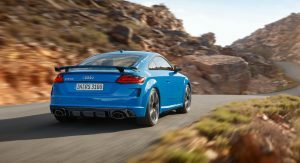 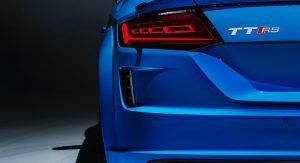 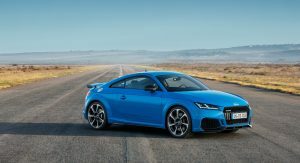 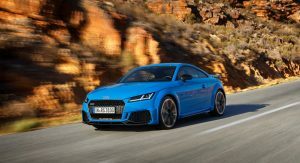 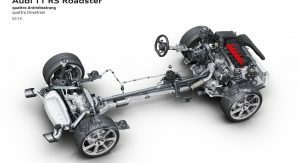 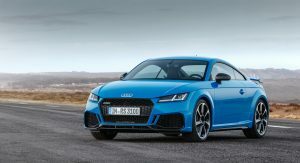 The five-cylinder is connected to a seven-speed dual-clutch transmission and Quattro all-wheel drive and allows the TT RS Coupe to hit 100 km/h (62 mph) in 3.7 seconds. 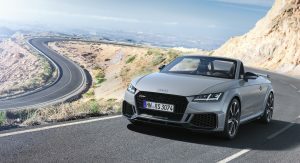 Top speed is limited to 250 km/h (155 mph), but can be lifted to 280 km/h (174 mph). 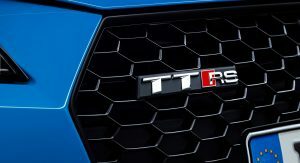 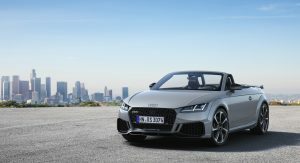 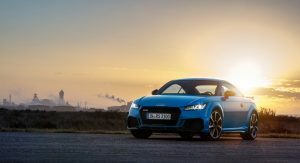 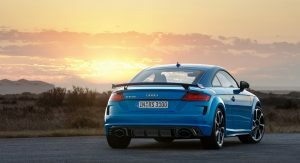 Audi will open the order books for the facelifted TT RS models in Europe on February 7. 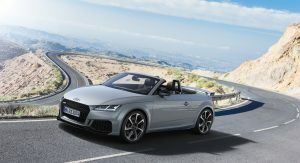 Pricing for the Coupe starts at €67,700 ($77,315) in Germany and the Roadster can be had from €70,500 ($80,512). 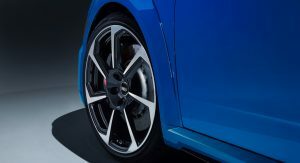 The first units will arrive at dealers this spring, and we might see it live at the Geneva Motor Show next month. 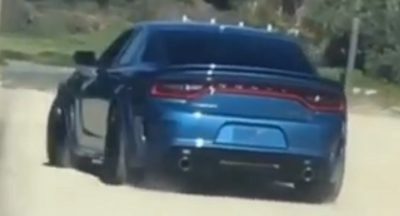 No front engine, FWD derived car should have fake rear engine vents. 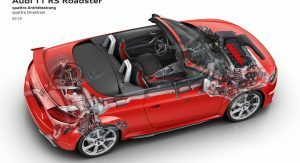 Especially not one from a self declared engineer’s company…. 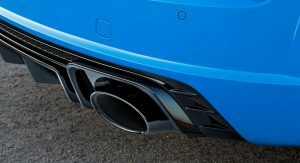 I don’t think they’re meant to look like engine vents. 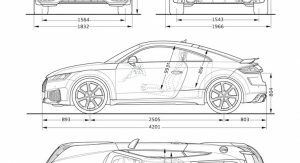 I know they’re almost certainly dummy vents, but sometimes functional vents in this position can be used to direct airflow from the arches to increase stability. 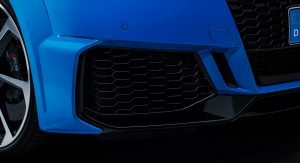 I think from a design point of view they help make it look a bit more aggressive over the TTS, but I can understand people who don’t like them. 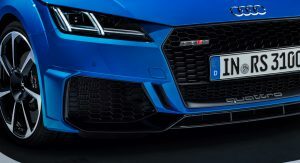 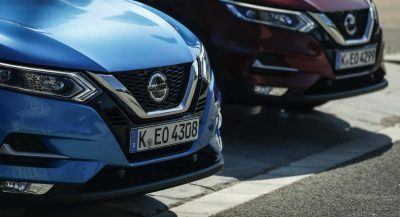 Anyway, in general I really hate th e- especially German – obsession with fake vents, huge (non functional) grilles and especially fake exhausts, German cars used to be “engineer cars” that had substance over style, now it#s very often the other way round…. 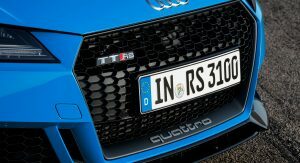 Actually, they are also on the new TTS also. 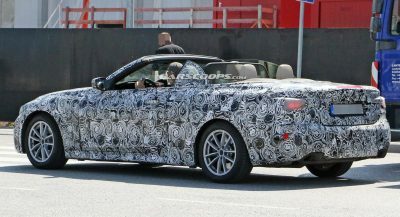 Honestly, the rear was lacking, so I think that the faux vents correct that flaw. 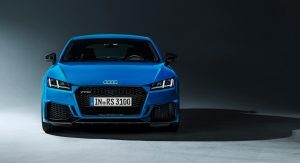 And you’re right ,they do add a bit of aggressiveness. 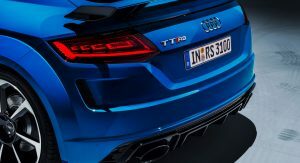 I totally forgot about the TT. 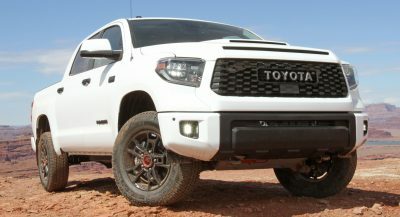 Do people still buy this thing? 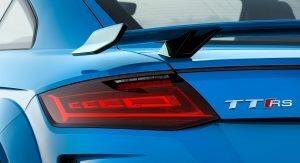 This category is pretty shallow. 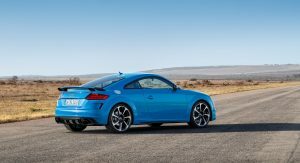 The segment is dominated by Porsche. 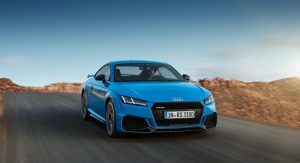 Audi is a runner up and an Evora would be a wild card pick so to speak. 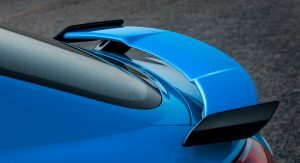 Interesting, an Evora was my second choice! 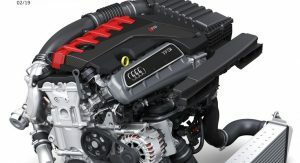 Yup, getting mine in August, maybe sooner! 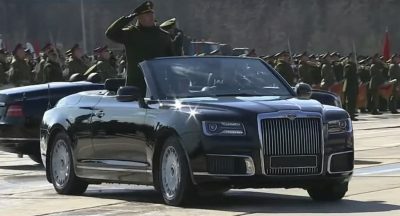 Good for you then,, you still have plenty of time to think this through. 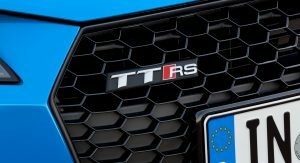 TT was always quite nice, overpriced, and a RWD chassis away from greatness.